DNAJB9 (DNAJ homolog subfamily B member 9) a membrane bound protein located in endoplasmic reticulum of several cell types participates in many cellular processes by regulating the ATPase activities of the 70 kDa heat shock proteins (Hsp70s). The gene for DNAJB9 is located on chromosome 7 and is a member of J family proteins. Nasr et al in the pre-print publication of KI reports, describe IHC for DNAJB9 as a specific marker for fibrillary glomerulonephritis. Though DNAJB9 granular staining is seen constitutively in many glomerular locations, the authors show that smudgy intense staining for DNAJB9 corresponding to the areas of fibrillary deposits is a highly specific and sensitive marker of fibrillary glomerulonephritis and is suitable for clinical application. This may obviate the need for electron microscopy in suspected cases. 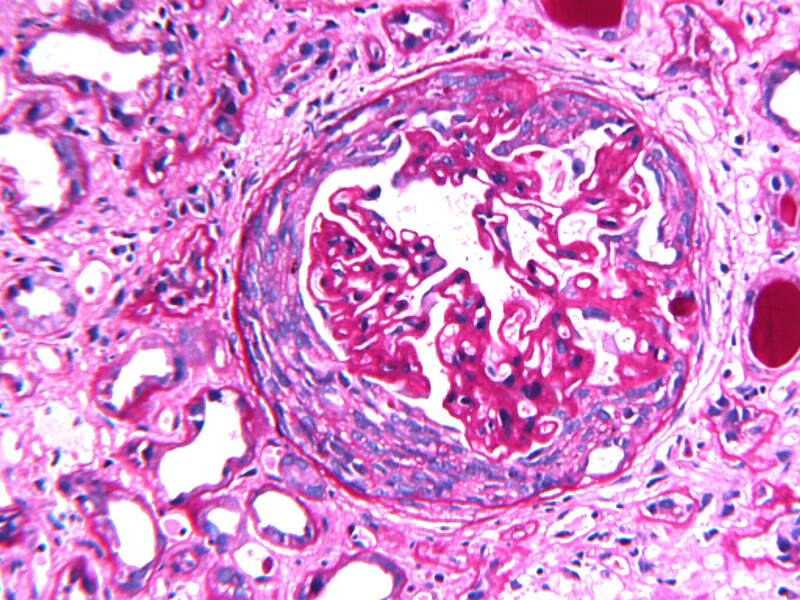 It may be noted that fibrillary glomerulonephritis is characterized by presence of non-branching randomly oriented fibrils measuring from 10-30 nm in diameter in glomerular mesangial & subendothelial areas and occasionally at extraglomerular locations along tubular basement membranes and vessel walls. The antibody for DNAJB9 with IHC paraffin application is commercially available and validation & recapitulation studies to confirm this important finding from other parts of the world should follow. Non Lupus " Full house Nephropathy"
It is not an uncommon scenario where "full house" positivity in DIF studies is encountered in absence of clinical features of SLE. While eventual development of SLE in these patients remains a possibility, few of these patients do not develop the distinct clinical features of SLE and these cases have been referred to as " non lupus full house nephropathy" (FHN) by some authors. Rijnink et al in the issue of Nephrology, Dialysis & Transplantation present a 20 year follow up of such patients and observe that ​idiopathic non-lupus FHN compared with lupus FHN was an independent risk factor for end-stage renal disease [hazard ratio 5.31 (95% confidence interval 1.47-19.24)]. Authors highlight the critical point of clinical recognition of idiopathic non-lupus FHN as a diagnostic category. ​Sekulic et. 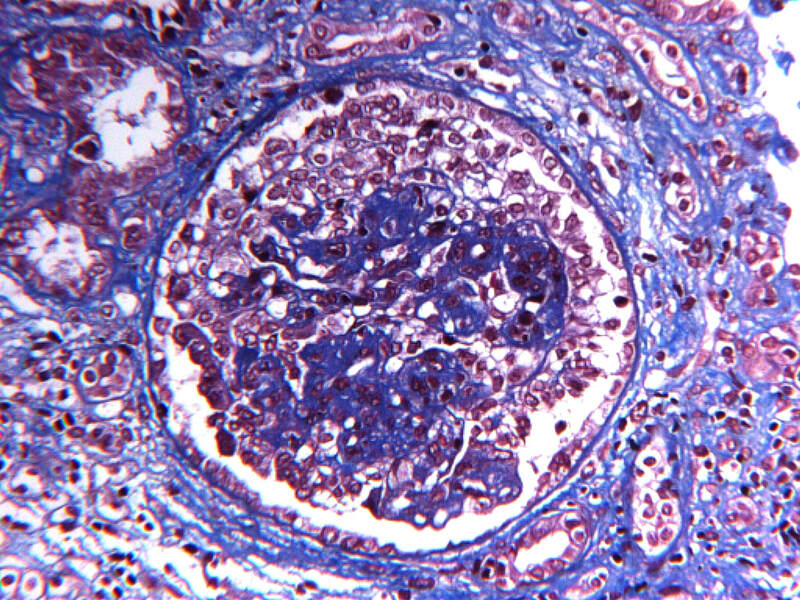 al in Clinical Kidney Journal, report an interesting first case of spontaneous histologically proven remission of fibrillary glomerulonephritis, observed in follow up biopsy performed 17 years after the initial diagnosis. ​Although FGN has been rarely reported to regress clinically, this is the first documented case of histologic regression of FGN. The potential for FGN fibrils to regress spontaneously is important in the management of FGN patients considering that currently available immunosuppressive agents have limited efficacy, and is an encouraging finding for future studies aiming to find a cure for the disease. 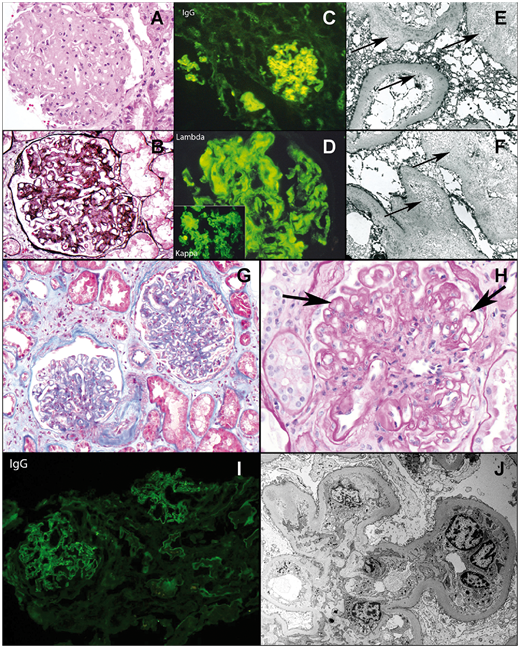 Cossey, Larsen and Liapis in recent issue of Clinical Kidney Journal, present an excellent insight into the journey of Collapsing glomerulopathy from a purely morphological diagnostic entity to its recognition as an injury pattern with diverse etiologies and also highlighting the role of APOL1 risk variants in individuals suffering from this glomerulopathy. The authors supplement the article with their own experience of about 1200 cases of collapsing GN ( data analysed in 88 sequential cases) and also describe a useful algorithmic approach to differentiate other entities which may morphologically resemble collapsing lesions. A must read for all ! 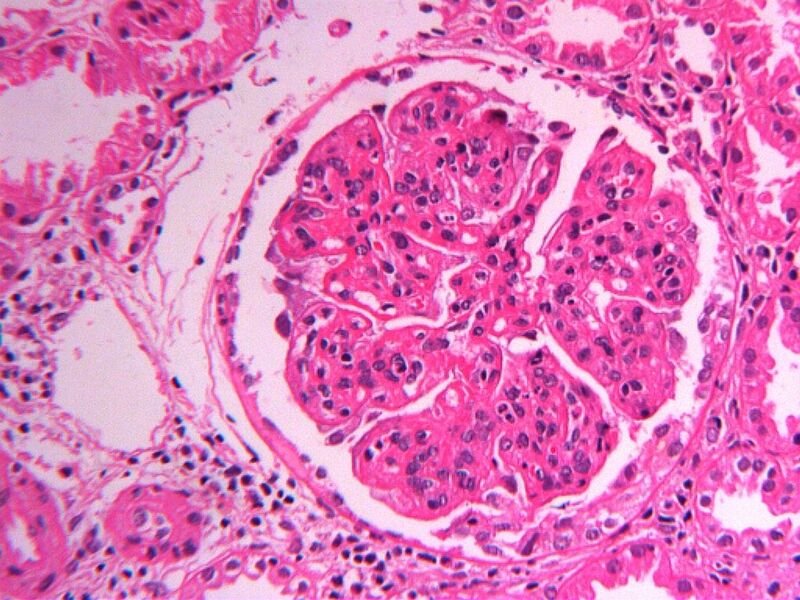 Crescents are occasionally encountered in biopsies of primary membranous glomerulopathy in absence of ​ANCA or anti GBM antibodies. Saito et. al have published a study of 16 such cases of MGN with crescents and followed up the patients for a mean duration of 79 months, comparing the clinicopathological features with a control group of 38 patients of MGN without crescents. ​Doubling of serum creatinine during follow-up was more frequently observed in the crescent group than in the control group (P = 0.002), although approximately two-thirds of patients in the crescent group were treated with immunosuppressive therapy. Crescent formation and interstitial fibrosis were risks for doubling of serum creatinine. Gelsolin amyloidosis is a rare type of amyloidosis typically involving the cranial and peripheral nerves, but rarely the kidney. This was first described in 1969 by Meretoja. In the recent issue of JASN, Sethi et. al have described the ​clinical, kidney biopsy, and mass spectrometry findings in 12 cases of renal gelsolin amyloidosis.The renal biopsy showed large amounts of pale eosinophilic Congo red-positive amyloid deposits typically restricted to the glomeruli. Immunofluorescence studies were negative for immunoglobulins in nine cases with three cases of smudgy glomerular staining for IgG. Electron microscopy showed mostly random arrangement of amyloid fibrils with focally parallel bundles/sheets of amyloid fibrils in a streaming pattern.p. The authors also found Asn211Lys gelsolin mutation on mass spectrometry studies in three patients , which appears to represent a renal-limited form of gelsolin amyloidosis. Thus, renal gelsolin amyloidosis is seen in older patients, presents with nephrotic syndrome and progressive chronic kidney disease, and histologically exhibits glomerular involvement. The diagnosis can be confirmed by mass spectrometry studies. A good review of Gelsolin associated amyloidosis by Solomon et. al. is a must read for deeper understanding of this entity. The web site is created and maintained by Dr. Alok Sharma and has no source of external or commercial funding. Advertising policy: We do not display advertisements on the website as a rule. Complete confidentiality is maintained of all the personal information and e mail addresses of individuals registered on this site.